When my friend called me last week and asked me if I’d like to help make noodles; I had no idea I was going to come home with six bread bags of a finished product. 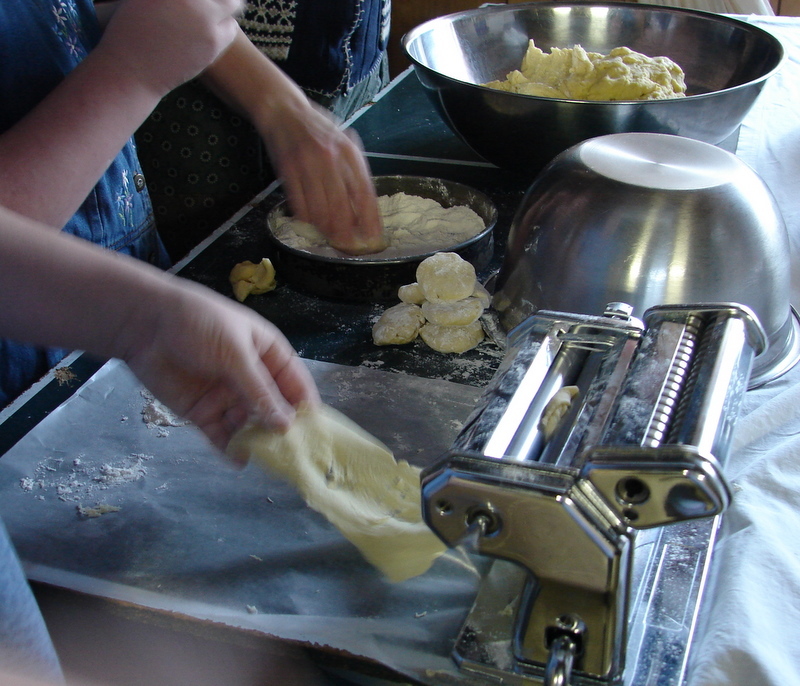 When I arrived at her house yesterday morning she had a large yellow lump of dough resting in her bakery waiting to be processed into noodles. Everybody helped. I am fascinated that we are in charge of what goes into our noodles. 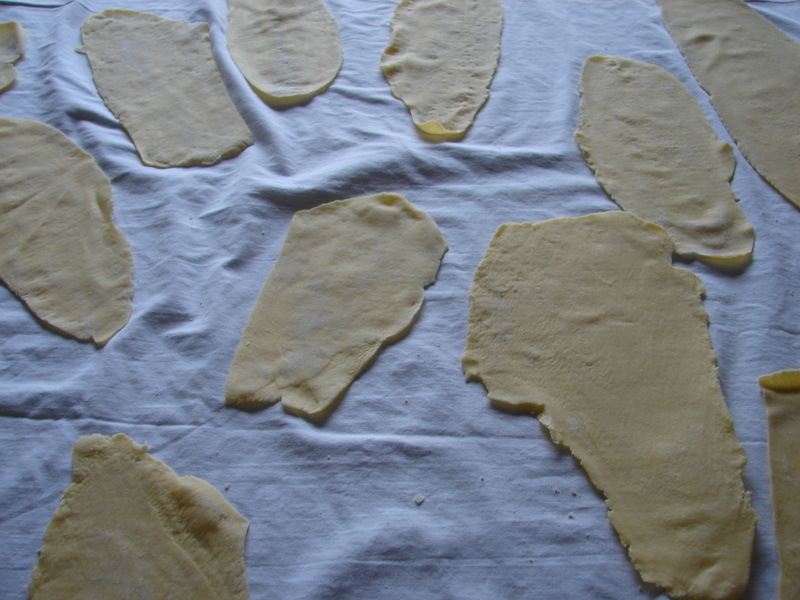 And it didn’t take Dorothy and I long to find out if we could make them with bean flour instead of wheat flour. Oh yes, you can! If any of my readers has one of these nifty little machines hiding way back there in the kitchen closet and you’d like to sell it to me…Comment please, and let me know. So we had Yummaseti for supper tonight. Now Yummaseti is a traditional Amish casserole. Yes, you can find the recipe on line, but they all called for tomato juice. That didn’t sound good to me. And I was sure that when I had made it long ago it only called for cream soups. Here’s a plug for Beth’s Cookbook. The Derstine Cookbook is probably the main cookbook that we have used for years around here. So when the web failed me; I pulled Beth’s cookbook down and found two recipes on page 51. Cook noodles until done. Brown hamburger with the onions. 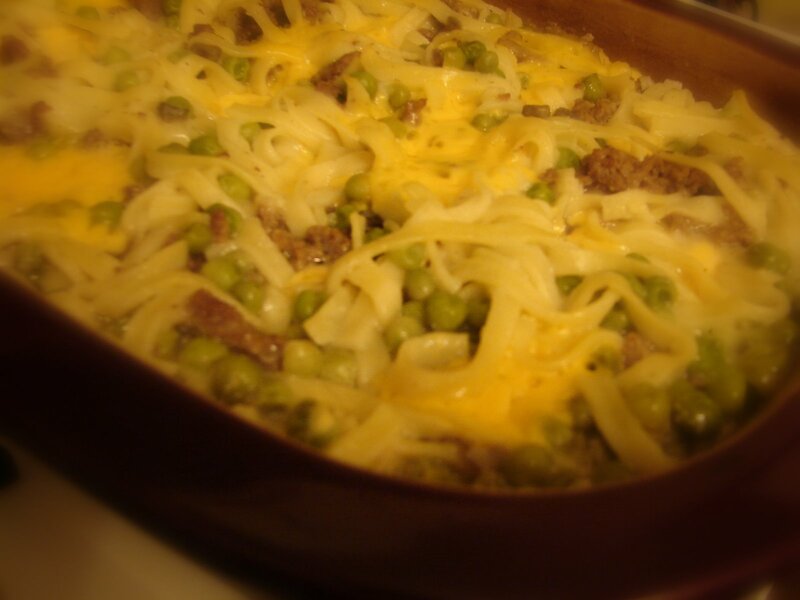 Layer the hamburger, noodles, and peas in a casserole dish. Add the soups and sour cream. Make the bread into croutons and layer on the top before baking. Or you can do what I did and add some cheese and bake covered for an hour then uncover and crumble crackers over the top, dot with butter and return to oven till brown. Serve with apple sause and fresh, warm homemade bread. I have one of those nifty little machines in my cupboard that mostly collects dust…but every so often when I get extra egg yolks…I do dust it off and use it…so sorry…but no you can't have! Ross did have one for not very much money…Ivan came 3 different xs to see if I needed one…If they still have it…will have to see!! Mmmmm…. that sounds yummy. I get hungry for food like this. 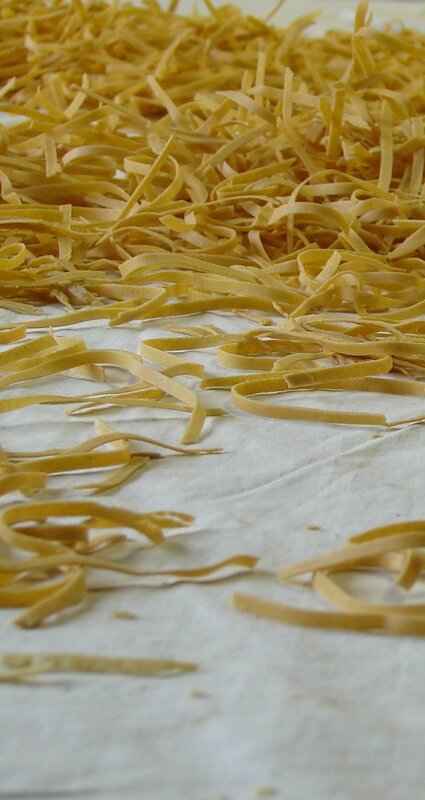 You should post your noodle recipe too. I don't know if I ever heard of bean flour before. Bean flour from Garbonzos which is actually a chick pea, but makes a good substitute for flour for some people who can't eat too much flour. These are made with regular flour and eggs yolks,Jenny. That's pretty well all they are. Look it up. I have the bosch noodle attachment. I never use it but I don't want to sell it either. How about you use it for a few years and then when I get in the stage of life where I can do things like that I'll ask for it back. Deal?